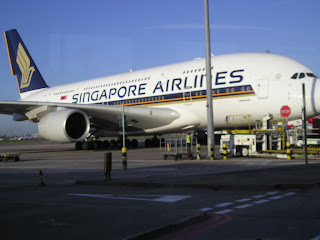 The above mentioned service compliments its currently exisiting daily A380 nonstop service to Tokyo's Narita airport. Swiss Airline's CEO has officially revealed in an interview to Bloomberg that the airline is actively looking out for a plane that can offer larger capacity than its current Airbus A340-300s as it finds the latter a bit too small for many of its long haul routes that can fill the additional seats offered by a bigger aircraft. LX is evaluating the B747-800, B777-300ER and the A350 family for a potential future order but has ruled out the Boeing 787.
a) Currently, LX 's A343s seat 219 pax in a 3 class configuration i.e. 8F/47J/164Y where as LH 's B748s in 3 classes seat 358 i.e. 8F/92J/262Y. For any airline to have their largest plane capacity size increase from 219 to 362 aka by 65% and have a chance at selling it consistently year long is a tall task to undertake. You can increase by 30-40% maximum if you have all the right mechanisms in place which LX does, but not by 65% all of a sudden ! b) The B748 is way too big for any LX route to operate on a "year round basis" which is the main point here as its not a carrier that lives on seasonal demand. LX is a premium focused airline that relies more on offering frequencies versus excess capacity on any given route as that is the main demand of corporate high yielding passengers i.e. choice of schedule flexibility when making their travel plans. a) To begin with, this order I reckon Boeing lost from the get go by still not being clear on their B787-1000X program. Due to this uncertainty on their part, this is another order which they could have gotten a new customer but instead are likely to lose it due to this aircraft type still not being offered for sale in the market place. Just like the A350 family has 3 different types catering to different market size segments, the B787 program too needs a 3rd larger unit complementing the B788 and B789 as neither one of these 2 models can adequately replace the A343 nor the B772ER in the long run. b) However, since the A343 is more or less the same size as an A359 and with LX 's desire to have a bigger plane operate on some of its routes year round, the only plane in today's current environment meeting LX 's requirement is the A340-600 which in LH 's 3 class layout seats 306 pax i.e. 70 more than LX 's A333s aka 30% more. For the time being, this is ideal as it would allow LX the perfect schedule flexibility of having the A333 operate on the under 11 hours routes across its network with a 236 seater A333 and have the A346 operate on the ultra long haul nonstop flights to Latin America, U.S. West Coast and SE Asia where the revenue derived from selling the extra seats on board the A346 (especially the higher yielding F/J class ones) shall come in handy big time. i. As a "stop gap capacity measure" in exchange for a size able A350 order, Airbus must supply LX with at least 8-10 A346s until the A350s get delivered. Currently, there are 3 airlines in particular that are very keen on selling their A346 fleet and they are TG, QR and VS respectively. ii. The A350 versions (if it lives up to its expectations) which are ideal for LX 's future are both the A359 and the largest member i.e. the A351. The A359 is the perfect replacement candidate aircraft for LX 's A333 fleet by 2020-21 as it offers about 10-15% more capacity which is perfect as the airline expects its passenger demand scale to grow by a similar margin if not more within a decade on currently operated A333 routes. A 3 class configured A359 would easily be able to accommodate approximately 260 passengers in a comfortable layout to replace the 236 seater A333s. In addition, due to its much longer range, the A359 can operate all of LX 's current long haul routes nonstop without any payload restrictions what so ever so an excellent value for money aircraft for the airline to consider purchasing. Currently, LX operates 14 A333s so if one factors in modest growth for the next 8 years, an order for 18 A359s seems adequate for the airline to order. iii. In addition to the A359, the larger A351 is the perfect high density long haul premium aircraft for LX to revolve its fleet around during the 2020-30 decade. In a luxurious 3 class configuration, it would easily be able to accommodate 340 passengers and fly up to 13-14 hours nonstop without any payload restrictions. This means having approximately 12% more capacity than today's A346 in LH 's 3 class configuration and operated with an aircraft that is destined to have at least 15-20% better operating costs on long haul flights. Currently, LX has 15 A343s operating in its fleet, so once again if you factor in modest growth over the next decade, an order for easily 20 A351s should do justice. iv. One last very interesting point in LX 's favor is that with all the bad publicity surrounding the A351 since Summer 2012, Airbus will bend backwards in offering ultra lucrative deals to blue chip airlines such as LX in order for a large reputable A350-1000X order being placed as they did with CX recently. This in turn can result in LX getting financially attractive large discounts on the purchase price as well as other forms of incentives from the airplane manufacturer in exchange for this order for 20 A351s + 18 A359s which at list prices would be worth over US$ 7 billion. v. Since LH now tends to order airplanes in bulk for its group subsidiaries as well, it has a fleet of 24 A343s + 18 A333s + 24 A346s that need replacing within a decade as well. Hence for the LH /LX group to really arm twist Airbus into giving a deal that they cannot say no to (in terms of volumetric discounts for a large scale order being placed), the prospective potential order size could very well end up being for 65 A350-900s (for LH /LX combined) + 50 A350-1000X totaling over US$ 20 billion at list prices! And for the latter program, Airbus wins too by getting 2 world famous airline brands such as LH and LX ordering and endorsing the A351 program along side QR /CX which will end up getting more airlines to order this variant in the future. In addition, TK too confirmed that due to increasing demand for its DAC-Dhaka bound flights, it will be further increasing its presence on this sector by operating daily nonstop flights using an A330-200 versus its current 5 weekly service. This comes into effect from 05JUN13. TK's main DAC traffic originates from Italy, ATH, JFK, UK, Libya and Germany. Air Asia X of Malaysia has officially confirmed that it shall be launching a new long haul service to JED-Jeddah, Saudi Arabia effective 16FEB 2013 as the carrier wants to take part in the mass volumetric Umrah and Hajj religious demand on this route along with catering to Saudi holiday traffic bound to Malaysia year round. D7 will be operating the service nonstop 4 times per week using an A330-300. Air China has officially announced that due to increasing demand for its Milan (MXP) bound services out of its secondary PVG-Shanghai hub, it will be up gauging the number of weekly frequencies it currently offers to meet the demand. Currently, CA operates 5 weekly nonstop flights between MXP and PVG using a 2 class configured A330-200. These will be increased to daily nonstop flights using the same aircraft type effective 01APR13. In addition, CA too revealed that it will be launching new nonstop services to GVA-Geneva from its primary Beijing hub effective 07MAY 2013. It will be operate 4 times per week using an A330-200 and will be code sharing with its STAR partner SWISS on this new route that is expected to attract good loads upfront in business class especially along with cargo.